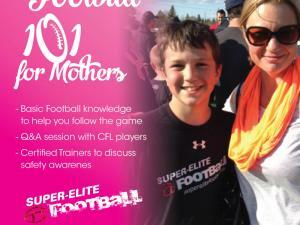 On Thursday Jan 19, Super Elite Football hosted a "Football 101 For Mom's" in Kitchener. Hamilton Tiger-Cat Mike Daly & Saskatchewan Roughrider Matt Vonk were on hand to teach mom's the football basics with some fun interactive demonstrations! The Football 101 for Mom's session was designed to give Mom's a basic in-depth understanding of the game of football. Not just from a position or game perspective, but a safety perspective as well. Matt Vonk & Mike Daly, current players of the CFL, broke down the x's and the o's to help moms better understand while they watch their sons play football and grow within its culture. Matt Vonk received his Master's of Neuroscience, and put together a plan for this class. He explained the benefits of Football and how it relates directly to cognitive function. Thanks to all the mom's who came out, it was a blast!